Bishop Jan Liesen responds to the news of the passing of Bishop Hubertus Cornelis Antonius Ernst, emeritus bishop of Breda, six weeks after celebrating his 100th birthday. The most senior of the Dutch bishops passed away late in the evening on Friday 19 May. Generally respected as a wise and well-spoken man, Bishop Ernst nonetheless never received a university education. In some quarters he was also seen a progressive bishop, which he was to a certain extent on the classic topics like celibacy, homosexuality and women, although he failed to get along with the liberal 8 May movement after this group ignored his advice and used a ‘table prayer’ of their own making at their annual manifestation. Bishop Ernst chaired Pax Christi Netherlands from 1976 to 1994, reflecting his concern with the projects of peace in the world. Under his guidance, Pax Christi and the Catholic Church in the Netherlands threw their support behind protests against the presence of nuclear weapons in the Netherlands and the world. In 1983, he spoke before 550,000 protestors in The Hague on this topic. He would later also be highly critical of the war against terrorism waged by the international coalition led by the United States. He based these positions in Pacem in Terris, Pope John XXIII’s 1963 encyclical on peace in the world. One of Bishop Ernst lasting achievements is considered to be the establishment of Bovendonk seminary in Hoeven near Breda. 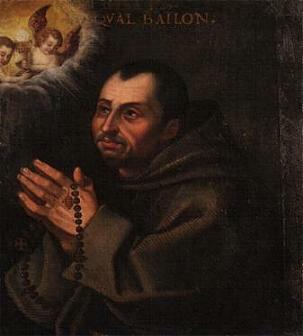 At his installation in Breda, the Theological Faculty Tilburg was responsible for the formation of priests. In 1983, Bishop Ernst estaiblished Bovendonk specifically for late vocations: men are educated and formed for the permanent and transitional diaconate, as well as the priesthood, initially while also holding their day job. Graduates from Bovendonk currently work in all dioceses of the Netherlands. The period of Bishop Ernst’s mission leading the Diocese of Breda coincided with a time of great change in Church and society. Over the course of the 1970s, he developed a program based on three observations: a decrease in the number of faithful; the presence of core group of faithful willing to carry responsibility in the Church; and a decrease in the number of priests, deacons and religious. Towards the end of his time in office he had concluded that the Church in the Netherlands was in a missionary situation and a minority in society. Bishop Ernst believed that the Church should distinguish itself through charity and displaying the contents of her faith through language, liturgy and the behaviour of faithful. Bishop Ernst tried to find a balance between Church doctrine and respect for the conscience of individual people. As such, he participated in the Synod of Bishops meeting of marriage and family in 1980. Following his restirement, Bishop Ernst continued to speak on topics of ethics and philosophy. In 2007, he reviewed a publication by the Dutch Dominicans calling for lay priests from among the faithful to offer the Eucharist when a real priest was unavailable. Bishop Ernst called this “incorrect, not sensible and not the right solution”. In 2011, Bishop Ernst was called to testify in a court case against an abusive Salesian priest. The bishop’s claimed to not have been informed about the priest’s past transgressions and found it unimaginable that the Salesians withheld essential information from him when he was asked to appoint the priest in his diocese. 1917: Born as oldest child of three in a Catholic family in Breda. He attended primary school at the parish school and the Huijbergen brothers. Subsequently, he went to minor seminary in Ypelaar and then the major seminary in Bovendonk. 1941: Ordained by Bishop Pieter Hopmans. He was appointed as parish assistant in Leur. 1943: Appointed as conrector of the Franciscan sisters in Etten. 1947: Moved to Bovendonk to teach moral theology there. 1957: Appointed as chairman of the (wonderfully-named) Society of Catechists of the Eucharistic Crusade. 1962: Appointed as vicar general of Breda by Bishop Gerard de Vet. 1967: Following the unexpected death of Bishop de Vet, vicar general Ernst succeeds him as bishop. He is consecrated by the archbishop of Utrecht, Cardinal Alfrink. 1980: Bishop Ernst participates in the Synod of Bishops on marriage and family, representing the Dutch episcopate. 1992: Bishop Ernst offers his resignation upon reaching the age of 75. Pope John Paul II appoints him as apostolic administrator pending the appointment of his successor. 1994: Bishop Ernst retires as apostolic administrator upon the appointment of Bishop Tiny Muskens. Bishop Ernst was main consecrator of his successor, Bishop Muskens, and served as co-consecrator of Bishop Johann Möller (Groningen, 1969), Jos Lescrauwaet (Haarlem, 1984), Ad van Luyn (Rotterdam, 1994) and Hans van den Hende (Breda, 2007). Bishop Ernst was the oldest Dutch bishop alive. On his death, that mantle passes to Ronald Philippe Bär, emeritus bishop of Rotterdam, who will be 89 in July. Yesterday saw the early retirement of Bishop Johannes Kreidler, auxiliary of the southern German Diocese of Rottenburg-Stuttgart, and the appointment of his successor. Unlike dioceses in most parts of the world, the ones in German almost all seem to come with a standard set of auxiliary bishops; when one retires, a new one is appointed almost immediately. There are exceptions, and some sees may do without an auxiliary bishop for a while, but they can expect the eventual appointment of one in due time. While Rottenburg-Stuttgart has two, other dioceses have rather more, with Münster topping the list with no less than four auxiliary bishops (and a fifth is expected to be named some time this year). In many cases the appointment to auxiliary bishop is a given for episcopal vicars of specific pastoral areas of a diocese. It makes for a rather large and – I imagine – unwieldy bishops’ conference. Back to Rottenburg-Stuttgart. The successor of 70-year-old Bishop Johannes Kreidler, who has retired for health reasons, is 48-year-old Matthäus Karrer. The new bishop is a member of the cathedral chapter and heads the department of pastoral planning in the Diocese of Rottenburg-Stuttgart. He joins Bishop Gebhard Fürst and Auxiliary Bishop Thomas Renz at the head of that diocese, which covers the central and eastern part of the State of Baden-Württemberg. Bishop-elect Karrer studied theology in Tübingen and Munich, writing a dissertation on “marriage and family as house Church”. He was ordained to the priesthood in 1995. In 2008, after more than a decade as parish priest in several locations, he was appointed as the first Dean of Allgäu-Oberschwaben. As expected the Dutch bishop’s conference today elected a new president after Cardinal Eijk announced, earlier this year, that he would not be available for a second term at the head of the conference. His successor is Bishop Hans van den Hende (pictured at left), ordinary of Rotterdam and in the past vicar general under Cardinal Eijk when the latter was bishop of Groningen-Leeuwarden. This is the second time that the presidency goes to a bishop of Rotterdam, after Bishop Ad van Luyn’s 3-year term from 2008 to 2011. The president is part of the permanent council of the bishops’ conference, together with the vice president and a third member. This council prepares the monthly meetings of the bishops. The vice president was until today Bishop Frans Wiertz of Roermond, but health reasons, which he so openly discussed recently in Lourdes, force him to step back as well. He is succeeded by the bishop of Breda, Jan Liesen (at right). The third member of the permanent council, Haarlem-Amsterdam’s Bishop Jos Punt also steps back, and he is succeeded by the new bishop of ‘s-Hertogenbosch, Gerard de Korte. The new permanent council represents a generational shift: the average age of the members drops from 68 to 56. Bishops Van den Hende and Liesen, aged 52 and 55, are even among the three youngest members of the conference. Bishop de Korte is the only council member who has been a bishop for more than a decade. Bishop van den Hende is the sixth president of the bishops’ conference since it was established in 1966. The first three presidents were the archbishops of Utrecht: Cardinals Alfrink (1966-1975), Willebrands (1976-1983) and Simonis (1983-2008). They were followed by Bishop van Luyn (2008-2011) and Cardinal Eijk (2011-2016). All three are elected for a five-year term. Hans van den Hende is 52, the youngest member of the bishops’ conference, but has been a bishop for almost ten years now. A priest of the Diocese of Groningen-Leeuwarden, he was appointed as coadjutor bishop of Breda 2006, succeeded Bishop Muskens as ordinary in 2007. In 2011 he was moved one diocese over and has been the bishop of Rotterdam since then. In the bishops’ conference he holds the portfolio for ecumenism. Jan Liesen, 55, was a priest of the Diocese of Roermond when he was appointed as one of two new auxiliary bishops of ‘s-Hertogenbosch in 2010. Less than a year later he was appointed to succeed Bishop van den Hende in Breda. In the bishops’ conference he holds the portfolio for liturgy and Bible. Gerard de Korte, 61 since yesterday, was a priest of the Archdiocese of Utrecht and auxiliary bishop of that same archdiocese from 20o1 to 2008. In that latter year he was appointed to succeed Wim Eijk as bishop of Groningen-Leeuwarden. Earlier this year, he was tapped as the new bishop of ‘s-Hertogenbosch. In the bishops’ conference he holds the portfolios for Church and the elderly, Church and society and women and Church. He is the nestor of the Dutch episcopate, and at 99 years of age Msgr. Huub Ernst is the 8th oldest bishop in the world today. Last Tuesday he marked the 75th anniversary of his ordination to the priesthood, with a solemn Mass in the cathedral of St. Anthony* in Breda, the same church were he offered his first Mass in 1941. As the retired bishop of Breda is confined to a motorised wheelchair, he concelebrated the Mass, which was offered by Breda’s current bishop, Msgr. 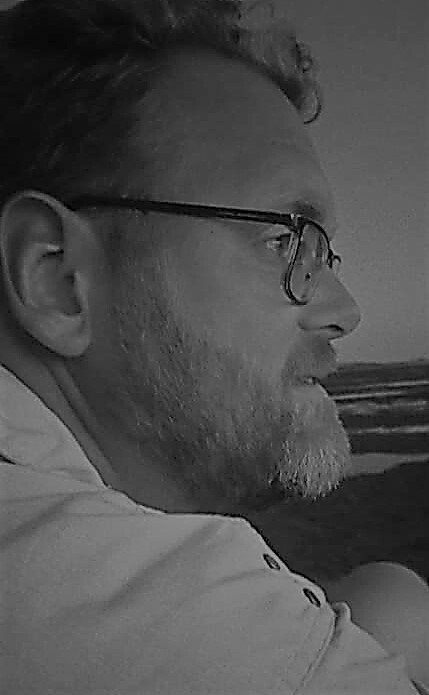 Jan Liesen. They were joined by Bishop Hans van den Hende, bishop of Breda from 2007 to 2011, as well as the current and retired vicars general of the diocese. Bishop Ernst was one of two priests ordained by Bishop Petrus Hopmans on 7 June 1941. After two years working in the parish he was called to a life of study, education and management. He was vicar general under Bishop Gerard de Vet (bishop of Breda from 1962 to 1967) and succeeded him upon his untimely death. Bishop Ernst, considered a progressive (but not so much that the liberal 8 May Movement did not succeed in alienating him) but also a wise and well-spoken theologian, would remain in office until 1992, followed by an uncommonly long two and a half years as apostolic administrator, until Martinus Muskens was appointed as his successor in late 1994. After his retirement, Bishop Ernst remained available for certain important events. Not only did he consecrate Bishop Muskens in 1994, but he was also one of the co-consecrators of Muskens’ successor, Hans van den Hende, in 2006. Bishop Ernst has lived long enough to see three bishops succeed him and survived his immediate successor. In 2007 he condemned the proposal of the Dominicans to have lay people be given the possibility to offer Mass as “incorrect, senseless and not the right solution”. In 2010 he was called to testify in a sexual abuse case, claiming that important information was withheld from him when he was asked to appoint a Salesian priest who would later abuse again, after which Bishop Ernst fired him. While Bishop Ernst is one of the oldest living bishops, he is even higher on the list of most senior bishops by ordination to the priesthood. Only four living bishops were ordained before Bishop Ernst, and among them is another bishop from the Dutch language area. 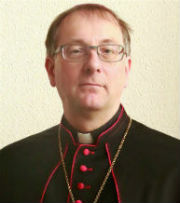 He is Belgian-born Bishop Jan Van Cauwelaert. Now at the age of 102, this Antwerp-born prelate of the Congregation of the Immaculate Heart of Mary was vicar apostolic and later bishop of Inongo, now in the Democratic Republic of Congo. *It wasn’t the cathedral back then, although it had been between 1853 and 1876, and has been again since 2001. The Dutch and Flemish bishops announced today that the new translation of the Lord’s Prayer, drafted over the past couple of years as a first step to come to a completely new translation of the Roman Missal, will enter into effect on 27 November of this year, the start of Advent. In August of 2014 the new translation was already presented, and I discussed the changes at that time in this blog post. The two bishops’ conferences each delegated a member to sit ona joint commission preparing the new translation. For the Netherlands that is Bishop Jan Liesen of Breda, and for Belgium it is Archbishop Jozef De Kesel of Mechelen-Brussels. Both prelates have released explanatory notes announcing the change: Bishop Liesen back in 2014, and Archbishop De Kesel today. “Until now this word has been translated as “bekoring” [temptation]. The Greek has peirasmos. This can be translated as both “bekoring” and “beproeving” [ordeal/test]. Most often this is translated as “beproeving”. So “beproeving” is the more concordant translation of the Greek basis. Translating it as “bekoring”, furthermore, presents a theological problem. “Bekoren” means to incite to evil. In Scripture this is said of the devil, not of God. God does not try and encourage man to commit evil. In that sense it is not God who tempts us, as the Letter of James (1:13) explicitly says. James responds here to an incorrect understanding of temptation or testing. It is not God, but, “when a man is tempted, it is always because he is being drawn away by the lure of his own passions”. Yet it is an undeniable Biblical concept that God can test someone’s faith. For example, Abraham was tested, and so Jesus was tested also. “Thereupon, the Spirit sent him out into the desert: and in the desert he spent forty days and forty nights, tempted by the devil” (Mark 1:12-13). The wording is striking and to the point: it is the Spirit who sends Jesus to the desert to be tested for forty days by Satan. The Spirit of God does not lure us into doing evil and tests us in that way, but He can bring us into situations in which our faith is being tested. These are situations in which we are presented with the unavoidable choice: for God and thus against evil, or for evil and thus against God. Only in and through the testing you know whether or not you really believe in God. Whether you, like Abraham, trust Him unconditionally, even in the darkest hour. This is also the meaning of the forty years in the desert. As Deuteronomy 8:2 says: “the Lord thy God led thee through the desert, testing thee by hard discipline, to know the dispositions of thy heart”. The current review of the translation of the Order of Mass on behalf of the Dutch and Flemish bishops was seen by the joint commission as a unique opportunity to realise a joint text of the Lord’s Prayer for the entire Dutch language area. Following the Second Vatican Council new translations of the Our Father had already been realised and introduced in other language areas. The Congregation for Divine Worship and the Discipline of the Sacraments made it known that, as part of the review of the Missale Romanum, a joint Dutch text of the Lord’s Prayer was diserable. So it took fifty years for an attempt to create a new translation of the Lord’s Prayer to succeed, and now it was only a matter of months. I suppose that shows how the polemics and pasionate differences of opinions following the Second Vatican Council have finally settled into a situation where bishops can agree on said translation. I say ‘bishops’ for a reason, since the general tone of the reaction I see on social media is one of disregard, mockery even, coupled with, in some cases, the decision to stick with the old familiar text. There are definitively parallels to be drawn with the introduction of the new English translation of the Missal in 2010. It’ll be interesting to see how the new translation will be accepted come Advent. Apparently there are people who look to me to predict who the new bishop of Groningen-Leeuwarden will be. Well, surprisingly, I don’t know. I am not privy to the deliberations of the seven-priest cathedral chapter of the diocese, let alone the thoughts of the other bishops, the nuncio or the Pope. Bishops de Korte and Hurkmans in Den Bosch, on Saturday. Behind them Auxiliary Bishop Rob Mutsaerts. But we can make guesses, for whatever that is worth. To do so, we can first take a look at the recent history of bishop appointments in the Netherlands. While auxiliary bishops are virtually always chosen from among priests and therefore need to be consecrated as bishops first, ordinaries – bishops who lead a diocese – rarely are. It is more usual for a new ordinary to be transferred from another diocese, as happened with Bishop de Korte on Saturday, or an auxiliary bishop being chosen. This happened, for example, when Bishop Jan Liesen was picked for the Diocese of Breda in 2011. He was auxiliary bishop of ‘s-Hertogenbosch before that. Of these, Bishop de Jong (at left) may have the best cards. A bishop for 17 years, he was allegedly in the running to succeed then-Bishop Eijk in Groningen-Leeuwarden back in 2008. Ultimately that appointment went to Bishop de Korte, but his time may now have come. Coming from a large diocese, he has relatively little experience with the process of parish mergers and consolidations as it is taking place in Groningen-Leeuwarden. This could speak against him. Of the other four, most attention has been on Bishop Mutsaerts. Seen as the opposite of Bishop de Korte in several ways, many assume that he will be removed to another diocese fairly soon. The likely choice is, of course, Groningen-Leeuwarden. In how far there is a basis in fact for this assumption remains to be seen. It is said that Bishops Mutsaerts and De Korte get on fine personally, and the latter would see the advantage of having an auxiliary bishop at his side as he familiarises himself with his new diocese. Bishops Hoogenboom, Woorts and Hendriks are possible choices to come to Groningen, but at the moment none really stands out as being more likely than the others. When it comes to the communication and opennes of Bishop de Korte, Bishop Hendriks perhaps comes closest. For the cathedral chapter he could be an option if they want to see the line of Bishop de Korte continue. The auxiliary bishops of Utrecht are reputed to be more in line with Cardinal Eijk. Of the other ordinaries in the Netherlands two are certainly too old to be transferred to another diocese: Bishop Jos Punt of Haarlem-Amsterdam is 70 and Bishop Frans Wiertz of Roermond 73. With the mandatory retirement age of bishops set at 75, they can safely assume that they will remain in their dioceses. 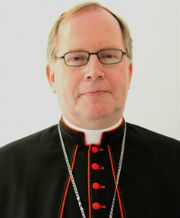 Another ordinary who will not be appointed is of course Cardinal Wim Eijk, the archbishop of Utrecht. He was the bishop of Groningen-Leeuwarden from 1999 to 2008 and as a rule bishops do not return for a second shift, so to speak (although canon law does not preclude it). A return would be seen as a demotion anyway, what with Eijk being an archbishop and cardinal. This leaves only two other ordinaries to be considered: Rotterdam’s Hans van den Hende (at right) and Breda’s Jan Liesen. Bishop van den Hende is a native of Groningen-Leeuwarden, serving as its vicar general before being appointed as coadjutor bishop of Breda in 2006. If he was to come home, it would mean his third appointment as ordinary, after Breda and Rotterdam. While not impossible, it is quite unlikely. And with only four years as bishop of Breda and almost five years and counting in Rotterdam, he may be excused for wanting to stay in one place for a while longer. That’s better for his diocese, too. Bishop Jan Liesen has been in Breda since 2011 and before that he was auxiliary bishop of ‘s-Hertogenbosch for a year and change. There is nothing really excluding him as an option for Groningen-Leeuwarden, except for his short time in Breda. Stability must be considered: it is probably not a good idea for the diocese to start looking for its third bishop in les than ten years. So, in my expert opinion (ahem…), if the new bishop of Groningen-Leeuwarden is to be picked from among the other bishops of the Netherlands, Bishop Everard de Jong and Jan Hendriks have the best odds, with Bishops Liesen, Hoogenboom and Woorts as possible runners-up. Pope Francis’ second Dutch appointment, which will certainly not happen before the end of May, and perhaps, as Bishop de Korte suggested, not before the year’s final months, could be a surprise. A priest native to Groningen-Leeuwarden may be a bridge too far just yet, but whatever will happen, it should be an interesting couple of months before us. The rumours now strong enough that several media outlets have also announced it, we can welcome the new bishop of ‘s-Hertogenbosch at 11am tomorrow. The official announcement from the Vatican will follow at noon. Retiring Bishop Antoon Hurkmans, who announced his stepping back for health reasons in September, will either retire immediately, or stay on as administrator of the diocese he led for almost 18 years. If he retires immediately, it is conceivable that Auxiliary Bishop Rob Mutsaerts will be appointed as administrator, although the cathedral chapter may also appoint another priest from their number. Bishop Mutsaerts, however, already took over a significant number of the duties of Bishop Hurkmans when the latter was taking it slower because of his health. Bishop Mutsaerts is also the most likely candidate to become the new ordinary, judging from various polls and expert opinions. Other names mentioned are those of Bishop Theodorus Hoogenboom, auxiliary of Utrecht; Msgr. Ron van Hout, vicar general of ‘s Hertogenbosch; Bishop Jan Liesen of neighbouring Breda (and former auxiliary bishop of ‘s-Hertogenbosch); and even Bishop Gerard de Korte of Groningen-Leeuwarden (although this, in my opinion, is more reflective of his general popularity than anything else). Or it may be someone else completely, of course. Whoever the new ordinary may be, he will be the first Dutch appointment for Pope Francis (not counting his appointment of Dutch Archbishop Bert van Megen as Apostolic Nuncio to Sudan and Eritrea) and also the first that Archbishop Aldo Cavalli, Nuncio to the Netherlands since March of last year, worked on. This first Franciscan appointment in the Netherlands will be interesting in light of the continuity (or lack thereof) with the appointments made under Pope Benedict XVI. The Pope emeritus is responsible for the vast majority of Dutch bishops being appointed. One of the exceptions was Bishop Hurkmans himself. Location of the Diocese of ‘s-Hertogenbosch in the Netherlands. The Diocese of ‘s-Hertogenbosch is the largest Dutch diocese in number of Catholics: 1.1 million in 2014, which is roughly half of the diocese’s entire population. It can trace its history back to 1559, when it was created out of territory belonging to the Diocese of Liège. In 1629 it vanished again, to be re-established as an Apostolic Vicariate in 1648. In the following centuries it lost territory to Breda and gained it from the Diocese of Antwerp and the smaller Apostolic Vicariates of Grave-Nijmegen and Ravenstein-Megen. In 1853, as the Catholic hierarchy was re-established in the Netherlands, ‘s-Hertogenbosch became a diocese again. The new bishop will be the tenth ordinary since then.